Later this month, Martin's off to San Francisco for a work meeting. This won't be featured in our calculations of our carbon footprints: if work incurs the financial cost of the trip, we figure they (and, ultimately, their customers) incur the carbon cost, too. 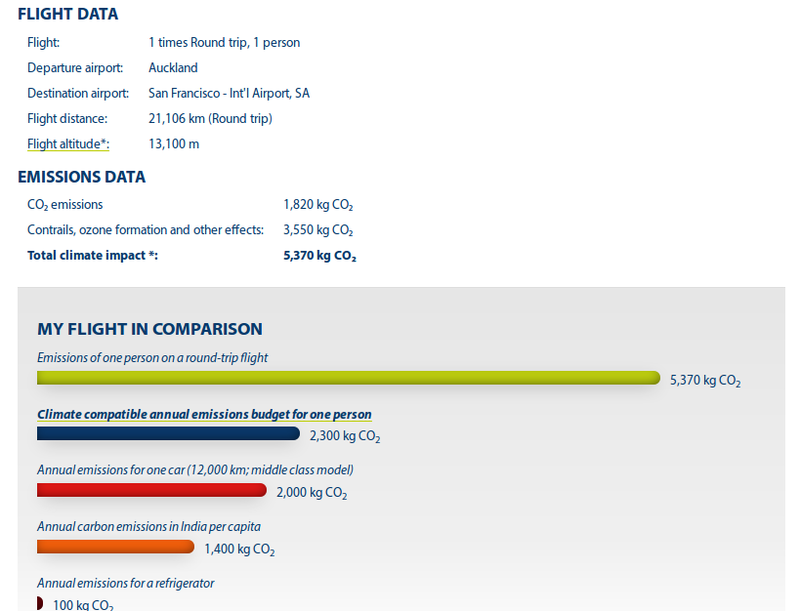 All the same, I was wondering what the carbon cost would be, so I plugged his flights into Atmosfair. He'll be flying economy and one way he'll be on a 777-300ER and the other way on a 777-200ER. 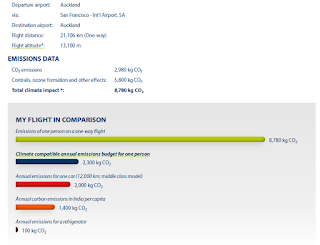 I was genuinely shocked to find that the carbon emissions of these flights add up to a massive 8.8T of CO2e! That's the same as the carbon emissions from every aspect of both our lifestyles over an entire year!!!! In the context of Martin's work, I don't think these emissions are unreasonable. Hapara make software that's used by vast numbers of students. Their business does seem to require a remarkable number of flights between their Auckland and San Francisco offices but, even if 100 such flights are made per year, that's less than 1kg CO2e per student per year (assuming 1 million student users). After all, over the course of a whole year that's the same as the emissions that same student would incur from a one-off 10km trip on the school bus. However, this kind of trip is something plenty of people we know undertake for pleasure once every few years. In that context, those emissions are astonishing: double everything else one of us incurs over the course of a whole year. As an aside, Air New Zealand appears to use uncommonly greenhouse gas-intensive planes. 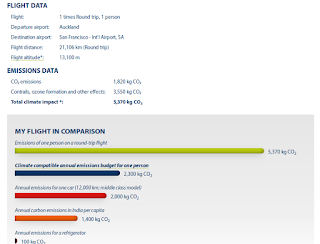 If Martin made the same trip using what an 'average' European airline would use for it (according to Atmosfair), the emissions would be only 5.4T CO2e, not 8.8. Similarly, for the trip to Timaru discussed earlier, he'd have been looking at emissions of around 500kg CO2e, not the 680 it actually takes. You could explain this for the long-haul flight by saying that maybe Atmosfair's data there isn't actually very good - after all, how many 12+ hour flights did they have in their European data set? - but after I saw it applied to the Timaru flights as well I've started to wonder if Air New Zealand is the problem. What plane is Atmosfair comparing against? Boeing claim "outstanding fuel efficiency" for the 777 http://www.boeing.com/commercial/777/, and the 300ER is the newest in the range. Unfortunately, atmosfair is pretty opaque about that (although it's clearly developed by academics, who I'm sure would be happy to explain their work to me if I contacted them directly. But that's an interesting point. Initially I thought that maybe it was due to the 777 flying particularly high or something (as the contrails etc. number is quite high), but it's no more, proportionately, than for their 'average' number. Given what you've said, it seems likely that they've made a mistake somewhere with what they consider average. Probably worth contacting them about, although I doubt I'll have the energy to do so!